He's transformed diners all over the city, but can George Liakopoulos stand up to the Wal-Mart army? Odysseas Liakopoulos, (left) and his son, George Liakopoulos. Born and reared near Lincoln Square, George Liakopoulos was only nine years old when he began working weekends for his father at the LaSalle Cafeteria. He'd get up at 4:30, accompany his father to the old place at Harrison and Wabash, and bus tables all morning. "It was exciting," says Liakopoulos, now 36 and the owner of a few diners himself. "You got to see what life was really about. You can go to school and get all the education you want, but in a diner you get to meet all kinds of people. Good people. Bad people. Thieves. It's a piece of life." This week Liakopoulos will unveil his own piece of life when the White Palace Grill reopens at Roosevelt and Canal. For the past three months he's been expanding and restoring the restaurant, which first opened in 1939. The $650,000 renovation includes a new chrome ceiling and modern plumbing, with red vinyl booths and silver tables installed at the north end of the diner. The new White Palace will seat 80 to 90 people, about twice the number it used to hold. Chicago has a long history of family-run diners. The White Palace was owned and operated by Saul Bookman and his son, Arthur. Bookman's brother-in-law, Jack De Mar, owned several diners around Chicago (the last De Mar's is still serving up sandwiches at Chicago and Paulina). Liakopoulos's father, Odysseas, arrived in Chicago from Tripoli and painted bridges around the city until 1958, when a relative asked him to help open the Victory Restaurant, a 24-hour diner at 18th and Wabash. Four years later Odysseas bought the LaSalle, which he ran for 13 years. In 1975 the building was blown up for a scene in a movie, but in 1983 he and some partners took over operation of Kallen's Restaurant & Lounge in Mount Prospect. Times change, and George Liako-poulos is a college man, with a degree in business administration from Loyola University. But he's still in the diner business. From 1983 to 1999 he operated the Golden Apple at Lincoln and Wellington, across the street from Saint Alphonsus Church (he still owns the building, though he's given up the diner). 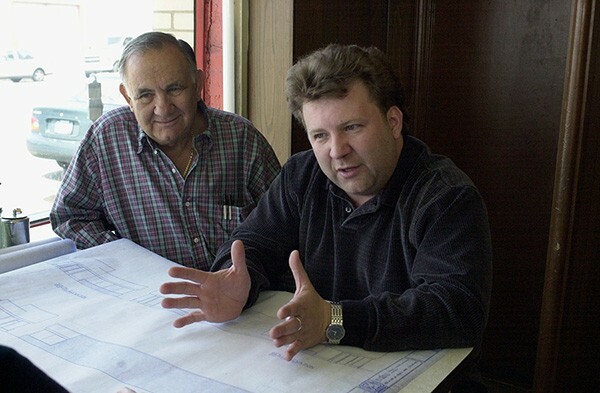 He and his father owned the building at North and Ashland where Arthur Bookman ran a Huddle House Grill, and after Bookman's lease expired in 1995 he turned the place over to Liakopoulos. Later that year Liakopoulos reopened it as the Hollywood Grill, now one of the most popular 24-hour diners on the north side. "It was a rough clientele when we came in," he says. "Drug addicts. Pimps. Gangbangers. You had a lot of garbage coming in off the expressway. There's a bus stop in front, so people would run out without paying. I changed the name for image purposes. I wanted a theme. The place was so colorful, it had that Hollywood atmosphere." Under Liakopoulos's management, the place caught on: Dennis Rodman and his entourage would pile out of their stretch limo after a night of club hopping and make an entrance at the Hollywood. But Liakopoulos didn't care for the feather-boa crowd either. "He was a nasty attitude guy. Famous or not famous, you treat people with respect." In November 2000, Liakopoulos bought the White Palace from Bookman, who by that time was 87. Three weeks later Bookman was dead. "He had this place in his heart," says Liakopoulos. "He had 18 Huddle House Grills he sold off. But he kept this. This is Chicago: the skyline, the railroad yards. Over the years he had many offers, but he never would sell. He told me I was the only one he would sell to." The White Palace is known for its spectacular view of the Chicago skyline, courtesy of a rare parcel of open land to the north. When Liakopoulos set out to renovate the diner, one of his architect's first suggestions was to add an upstairs garden so more customers could enjoy the view, but Liakopoulos nixed it. "That would kill the image," he says. "It's not a diner then. What is it? You would have to put in elevators. It's totally commercialized. It was a good idea, but it's not a good diner." On the other hand, the place needed work. "I had to fix it," he says. "It was time. We're trying to do as much as we can to restore what it looked like in the 1950s. An old diner is an old diner. You can only go this way or that way." The rounded red, white, and blue sign at the Canal Street entrance has been duplicated on the north end of the building. The open kitchen and exposed brick are preserved at the front end of the space, though the tiny bathroom in back has been replaced by a proper men's room and ladies' room. New red and white tile has been installed in the north dining room, along with a wacky mural on the east wall. Designed by artist Scott Jackson, it shows an assortment of famous Chicagoans playing go fish: Harry Caray, Michael Jordan, Richard M. Daley, Oprah Winfrey, Muddy Waters. Near Mrs. O'Leary's cow sits Al Capone, sipping a martini. Tim Samuelson, recently appointed cultural historian for the city of Chicago, has often brought out-of-town visitors to the White Palace. "It is the classic urban diner," he says. "The buildings were designed relatively inexpensively but were meant to attract attention. They did it with brightly lit large-scale signage, big plate-glass windows so you could look inside....In some cases, when you compare New York or Boston, Chicago had a lot more real estate. You could build a bigger restaurant so you could have the luxury of having a counter along with tables." Samuelson hasn't seen the new White Palace, but he gave the old one high marks. "When you're sitting there, you can see the quilted metal behind the grill, the wear patterns on the floor or on the counter from all the people that sat there before. It's part of the character." Other customers are less focused on aesthetics but equally loyal. "When they closed for remodeling, there was no other restaurant where the waitresses knew my order the minute I sat down," says Vernon Overton, a former high school custodian who's been a regular at the White Palace for more than a decade. "So I stopped eating breakfast." The diner's clientele is thick with bus drivers, construction workers, police officers, city workers, postal employees, and a few barflies. "One time a man came into the White Palace and sat in the corner," Samuelson recalls. "You could see it was someone who was having problems. The server made him as welcome as anybody who would walk through the door. She laid down the rules, as if to say, 'You behave yourself and I'll take care of you.' It was not done in a condescending way. It's really a wonderful thing." Liakopoulos works hard to find good waitresses for his diners. "I look for personality in a waitress. Even if it's cocky, that's an attraction. It's good when the customer can respond. The problem with waitresses is you might go through ten of them before you find a good one." Fast-talking Edna Rosario is his Triple Crown winner, having waited tables at the Golden Apple from 1985 to '97, at the Hollywood Grill from '97 to 2000, and at the White Palace since then, working the morning shift. "The Hollywood was wild," she says, waving her long silver fingernails. "The Apple had a bigger menu. The White Palace didn't even have tomatoes, french fries, or shakes. The Apple always had yuppies, Latins. When I first came [to the White Palace] it was a majority of blacks. Tips were a hell of a lot different, too. They were good at the Hollywood Grill and the Apple. At the White Palace I had to train the customers to increase the tips. I was very flirtatious and kind of crazy." The diner's waitresses aren't the least bit upset about the renovation. "People have been worried that everybody was gonna change along with the place," says Dorothy Williams, a ten-year veteran of the morning shift. "But we're gonna stay the same. I like the change. The counter was literally rotting. We had to bend over and do all our dishes by hand. Now we'll have a dishwashing machine." Liakopoulos has gotten lucky buying diners and then seeing their neighborhoods turn around--to his benefit. He doubled the capacity of the Golden Apple to 133 seats, and now west Lakeview is prime Chicago real estate. "I don't have a problem with all the yuppies who were coming in the neighborhood. But when you come in a restaurant a little drunk at three in the morning, you cannot ask for low-calorie salad dressing, omelettes with Egg Beaters, or a nonsmoking booth." The White Palace has never seen much residential traffic, but the wholesale development of the South Loop has made the vacant lot north of the diner a valuable parcel. Last year Home Depot was angling for it, though that plan was deemed too expensive because the site, once part of a rail line, is below street level. Now Wal-Mart has asked the city for an $18 million subsidy to develop the parcel, with a two-level store and a parking garage for more than 800 cars. Peter Scales, spokesman for the city's department of planning and development, says the Wal-Mart proposal is in the earliest approval stages. "We're reviewing a proposal from developers," he says. "Wal-Mart would be a tenant in this space. But nothing has been formalized. They only submitted those plans to us within the month. It's a complicated site because of that weird elevation. More than likely that's why it has stayed vacant all these years--its abandoned railroad tracks. But it is a great place to do business, and we think a big-box retailer works there. And the White Palace Grill was part of both of the plans." "Before I bought the place, the city gave me assurances I will stay here," says Liakopoulos. "I don't want to be taken over. Home Depot offered me over a million dollars to clear the space. I said, 'Excuse me, you can't clear history.' So they made plans to build around me, and we had a good working relationship." But no matter who gets the parcel, the White Palace may lose its view of the city skyline. Though he rejected the idea of a second story, Liakopoulos did incorporate the view into his expansion, installing a window at the north end. "On weekends, 30 to 40 people a day come here just to take pictures, or they stand on the Roosevelt Road bridge," he says, gazing out the west windows at the encroaching Dominick's, Walgreens, and Payless. He's a business-man, but he's already turned down attractive offers from developers who wanted to replace the Hollywood Diner with a Walgreens and the Golden Apple with condominiums. "What are we going to have in this city?" says Liakopoulos, who commutes here from Des Plaines. "A bunch of Wal-Marts and Home Depots? I'm born and raised in Chicago. Some out-of-state corporation coming around to buy me out? What's that? What about small business? And I didn't ask for $18 million from the city." Art accompanying story in printed newspaper (not available in this archive): photo/Kathy Richland.